June 26-July 1st 2019 | 6 days 5 nights | The best place, at the best time. 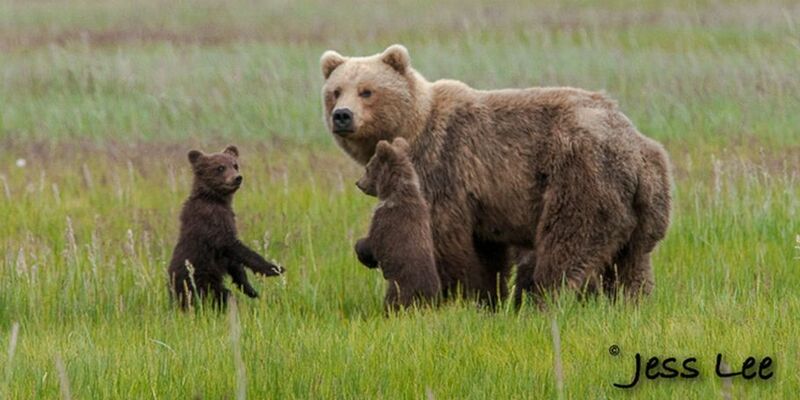 This is one of the best times for photographing these grizzly and their young cubs. 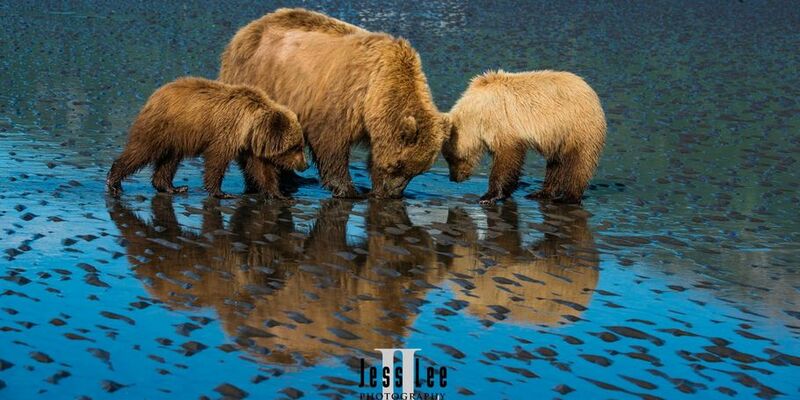 You will have internationally acclaimed photographer Jess Lee and long time bear photographer at your side giving instruction on how to get the best photos of cubs playing, brown bears courting and the beauty of the Alaska wilderness at Silver Salmon Creek Lodge. 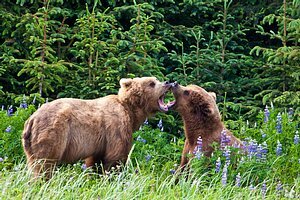 You are invited to join Jess with a small group of adventurous photographers this great Alaska Bear Photo trip. We will fly in our private bush planes directly from Anchorage to our lodge on the edge of the fabulous Lake Clark National Parks wilderness for 6 days and 5 nights of pure Alaska wilderness wildlife photography heaven. Our lodge (Silver Salmon) is first rate in its comfortable accommodations, food and hospitality. Even the bears love this place, we often watch them in the yard from our dining room. When you are with Jess the first goal will be for you to capture great photos. 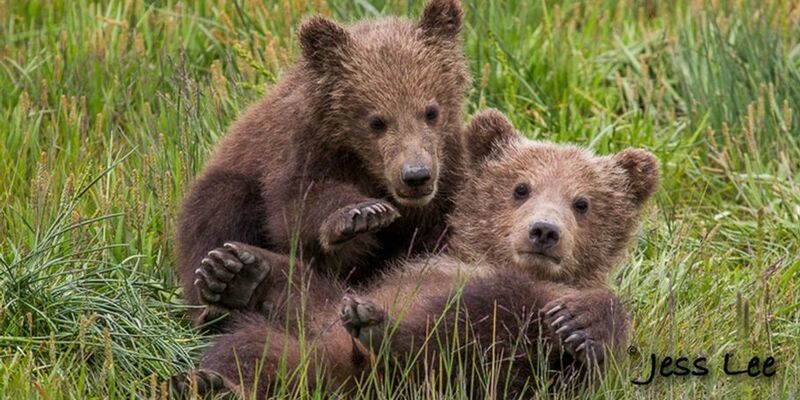 You will take advantage of Jess's long experience of knowing wildlife behavior and nearly 4 decades of photographing bears. 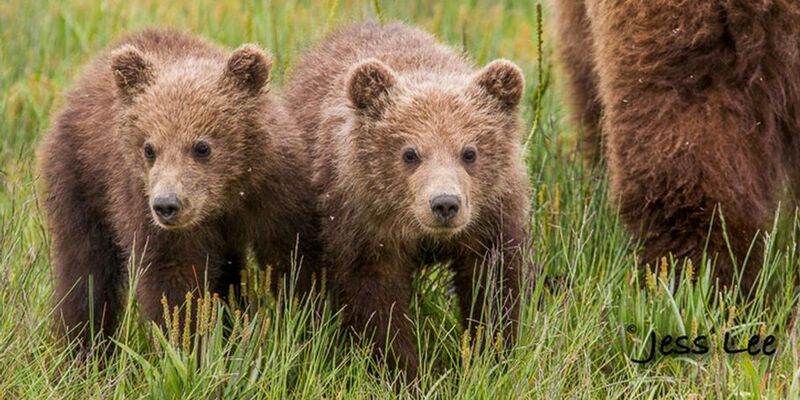 The majestic Brown Bear or Alaska Grizzly will be our main quarry but nearby pelagic bird populations, including horned and tufted puffins, black-legged kittiwakes and murres. Bald eagles, trumpeter swans, and harbor seals can also be targeted. Scenic backdrops include volcanic Mt. Iliamna, Mt. Redoubt, and Augustine volcano, all part of Cook Inlet's "ring of fire." 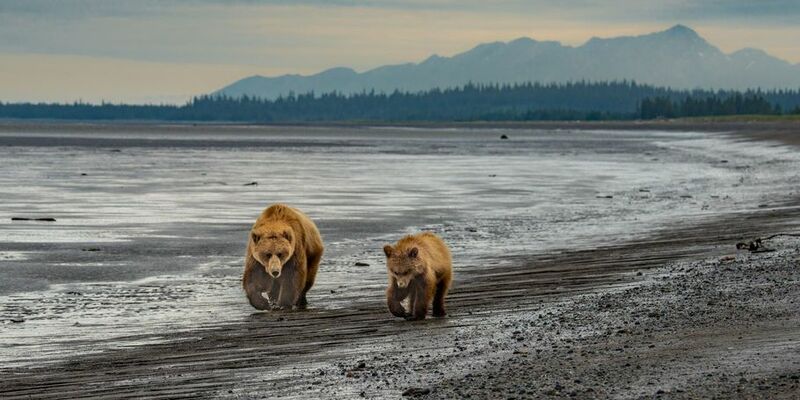 Late June is a transition time for Bears at Lake Clark. 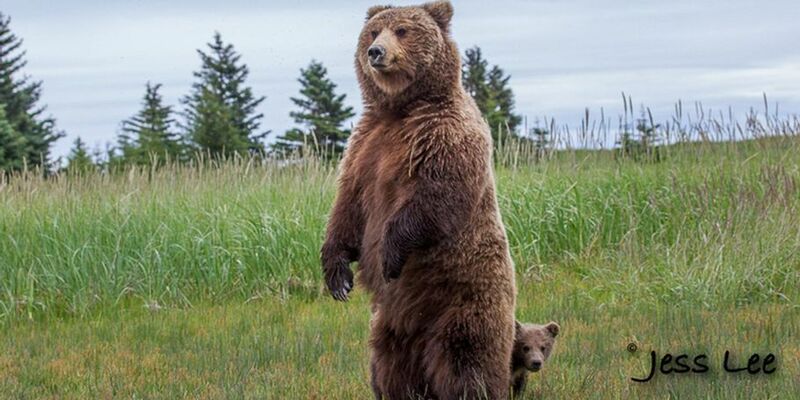 The breeding season is just winding down and the mother bears with their new cubs are just starting to show up. 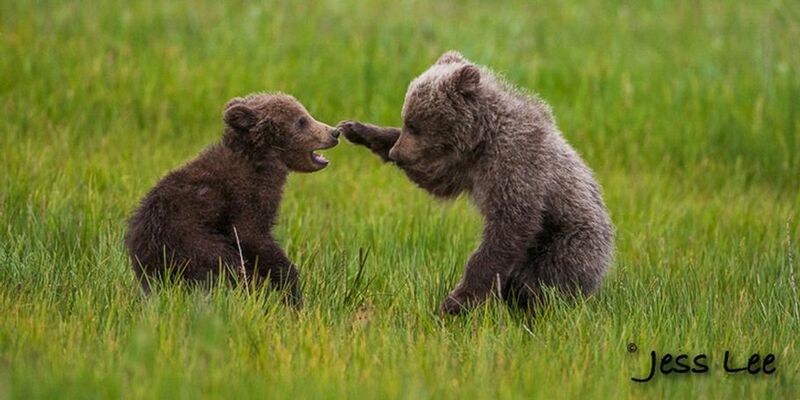 This give us as photographers a great variety of interactive scenes between the bears. 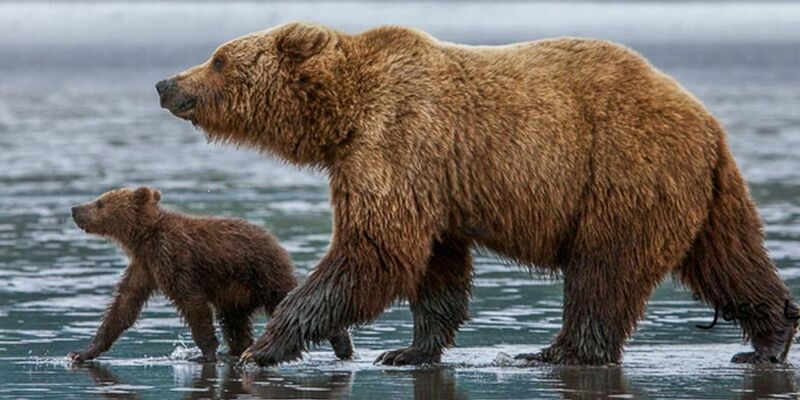 After mid July the bears start to disperse into the mountains and along the coast. 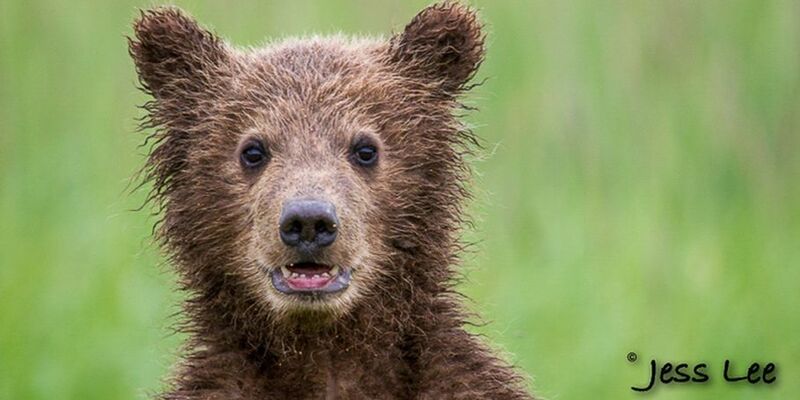 This area is a concentration point of bears and their activities from mid June to mid July with daily bear photography opportunities of numbers of bears seen in the teens. 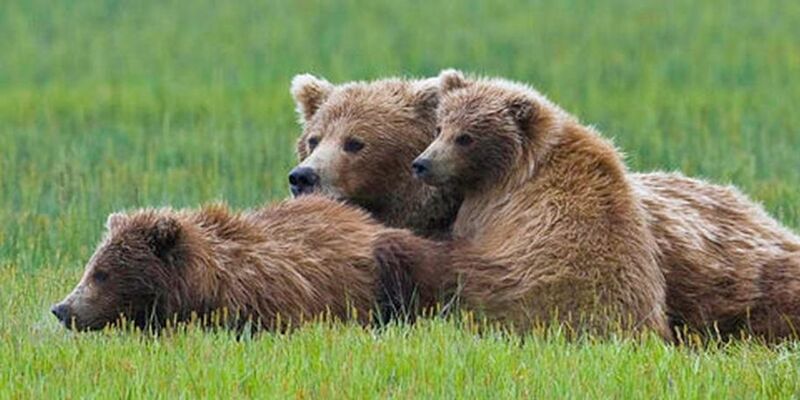 Later in the season it is possible to only see from 1-3 bears on the trip. Late June is also usually the peak of the flower bloom and bears love lupines. All of this makes Jess's Alaska adventure a favorite. 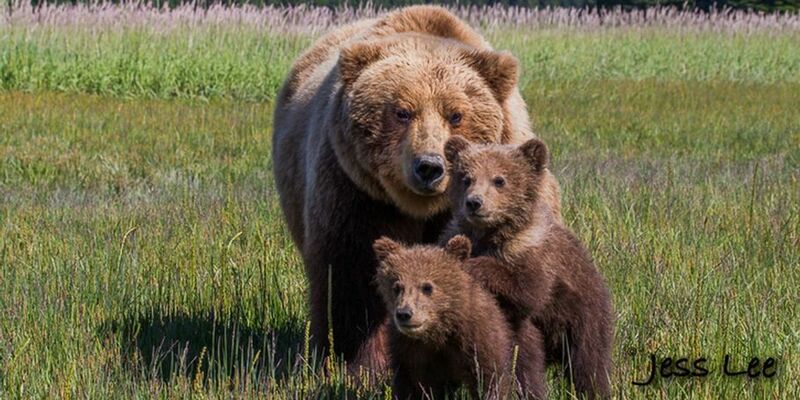 Touted in Outside Magazine and one of the top Alaska Bear photography trips you will not only spend your time filling you hard drives with great images but you will learn many of the techniques used to produce fabulous award winning photographs from one of today's best working photographers. Jess will be available to review your work giving you suggestions and examples of how to make you images stand out from the crowd. He will show you some of his processing techniques for not only editorial images but some of the latest work flow using NIK software to help you produce stunning fine art prints. In the field Jess will be shooting along sided you and taking time to offer advise how to shoot and what to look for in grizzly bear behaviors to make you images special. In this atmosphere Jess will take time to give you individual instruction while we are shooting. This is where you can learn best at a time when you can directly apply what you are learning. There will be time during the mid day breaks to study and fine tune the skills you will come to master. All participants should be in Anchorage the day prior to our departure. We will be flying out of Anchorage early the morning of the 26th for Lake Clark. We will return to Anchorage mid-day the last day of our adventure. Weather delays, though not frequent, are possible so we suggest you book your return flights home the day after your return to Anchorage. Cost $5295. Includes bush plane flight roundtrip from Anchorage and everything in between! 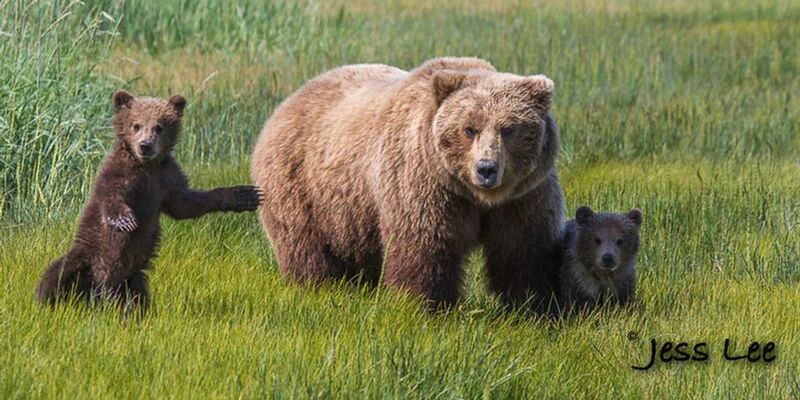 6 Days and 5 nights from Anchorage including meals and bush flights to our wilderness lodge. Lodging meals and transportation in Anchorage is not included. Plan to arrive in Anchorage on the 25th to be ready for our early bush flight on the 26th. $750 Non refundable deposit holds your place with this small group of Alaskan adventures. 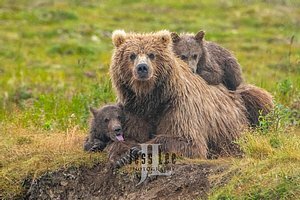 Space is already filling so Email Jess@JessLeePhotos.com or call 208-521-5170 to reserve you place on this great trip to Lake Clark National Park Alaska. RESERVATIONS: Your non refundable deposit is required to secure your place on any trip, with the balance due 120 days prior to the departure date. CANCELLATIONS: All cancellations must be confirmed in writing, and due to costs incurred by JessLeePhotos in arranging a tour, deposits are non refundable. Payment in full is required 120 days prior to departure. Cancellations after 120 days will receive a full refund if your spot can be filled from a waiting list or if you can fill your spot.